Papers: 5 audiotapes (1962-1965) in Westinghouse Broadcasting Company collection, 1945-1981. Papers: Correspondence in League of Women Voters of LA Records, 1920-1980. Oral History: May 15, 1980. 22 pages. Closed. Papers: In J. Arthur Younger papers, 1951-1968; and Francis V. Keesling papers, 1906-1957. Papers: Ca. 1955-1968. Ca. 400 cartons. Correspondence, speeches, press releases, memoranda, briefing papers, films, photographs and memorabilia. Also letters in several other collections. Oral History: 1969, 1971, and 1972. 55 pages. 3 interviews, pertaining to his years as state comptroller. Part of the Earl Warren project. Papers: Correspondence in Wilber M. Brucker papers, 1877-1968. Finding aid. Papers: A 201-page photocopy of Horns notes taken during meetings of a bipartisan Senate group working for final passage of the Civil Rights Act of 1964 in the Staphen Horn collection, 1963-1964. 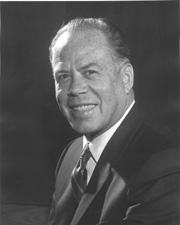 Horn was Kuchels legislative assistant at the time. Papers: Correspondence in Dewey Anderson papers, 1939-1975. Papers: In Congress of Racial Equality records, 1959-1976; and Edwin Richard Weinerman papers, 1908-1970.